China is shifting its space programinto high gear, withrecently announced goals to build a manned space station by 2020 andsend a spacecraftto Mars by 2013 ? all on the heels of its second robotic moon missionthis year. Yet some space analysts worry thatChina's ascendancy inspace means the waning of American superiority in spaceflight. TheUnitedStates is retiring its storied space shuttle fleet in 2011 and plans torely oncommercial spaceships for orbital flights, once they're available,whileplanning future deep-space missions. "Certainly [the Chinese] see it as anopportunity togarner prestige at a time when the U.S. space program is in what somepeoplecall turmoil, and what others call regrouping," said JoanJohnson-Freese,chairwoman of the department of national security studies at the NavalWarCollege in Newport, R.I., and an expert on China's space program. AmongAmericans, she said, "there is the perception that China is somehowgetting ahead, that the U.S. is sliding behind." China has announced an ambitiousprogram for the comingyears. The planned Chinesespace station will be the centerpiece of the country's mannedspaceprogram, which has seen three crews ? each larger than the next ?launch aboardChinese Shenzhou spacecraft starting in 2003. China hopes to launch its firstunmanned space stationmodule, Tiangong 1 (Chinese for "HeavenlyPalace"),in 2011, the state news organization Xinhua has reported. Over time,othermodules will be added on and astronauts will eventually take upresidence onthe station to conduct research. The new space station will beconstructed using China's Shenzhoucapsules and Long March carrier rockets. These spacecraftestablished China as only the third country, after Russia and theUnitedStates, to independently launch people to space. China recently celebrated the successof its second lunarprobe, Chang'e 2, which launched in early October and arrived in orbitaroundthe moon. The first photosfrom China's second moon mission marked the Chang'e 2 probe'ssuccess,revealing details of an area in the moon's northern hemisphere known asSinusIridium (Bay of Rainbows). "The success of Chang'e2 in accomplishing its mission marks another greatachievement after thecountry successfully launched its first lunar probe," VicePremier ZhangDejiang said after the photos were released, according toXinhua. "TheChinese people will unswervingly develop technologies for theexploration ofdeep space and the peaceful use of outer space." Chang'e 2 is on a mission to scoutout possible landingsites for a planned Chinese unmanned spacecraft to touch down on thelunarsurface, possibly in 2013. 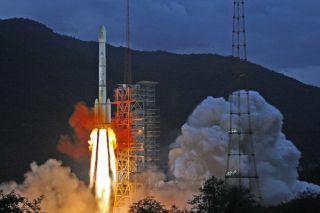 China's first moon orbiter, Chang'e 1,launched inOctober 2007 and conducted a 16-month observation mission beforecrash-landingon the moon as planned in March 2009. Although the country has notofficially announced plans tosend people to the moon, many experts say that's where they're heading,andthat the space station project, lunar surveyors and robotic landers aremerelythe setup for that goal. "They're very conservative aboutlaying out theirgoals," Johnson-Freese told SPACE.com. "They have not announced anofficial manned lunar program. They want to have all the buildingblocks inplace for success before that's announced." In addition to its moon programs,China has also drawn up atechnical plan for a spacecraft to orbit Mars, Xinhua reported. Thatmissionwould build upon the technology developed for the two moon missions.Theearliest possible launch date for the Mars orbiter is 2013. Meanwhile, the country has launched arecord total of 14 rockets in2010so far, beating the recordfor most Chinese space missionsin a single year. A number of these payloads were Chinese Beidounavigation satellites and Yaogan military spacecraft. Allin all, China's space accomplishments are gaining worldwide notice. "Tothe rest of the world, China's working very eagerly and aggressively," Johnson-Freesesaid. "Canada, Europeand Russia are all banging on the door for China to work with them. Icertainlyhave a concern that the U.S. is going to end up the odd man out interms of theglobalization of space." Whilesome American lawmakers have expressed wishes to cooperate with Chinain space, the idea also faces strong resistance. A trip lastmonth by NASAchief Charlie Bolden to China sparked controversy. "It should go without saying thatNASA has no businesscooperating with the Chinese regime on human spaceflight," U.S. Rep.FrankWolf (R-Va.) wrote to Bolden in an Oct. 5 letter before the visit. "Chinais taking an increasingly aggressive posture globally, and theirinterestsrarely intersect with ours." In a response letter, Bolden said thetrip was intended to be "introductoryin nature" and would not include discussions about specificopportunitiesto cooperate in human spaceflight. Forits part, China has expressed willingness to cooperate with othernations,though all its space achievements so far have been largely solo.